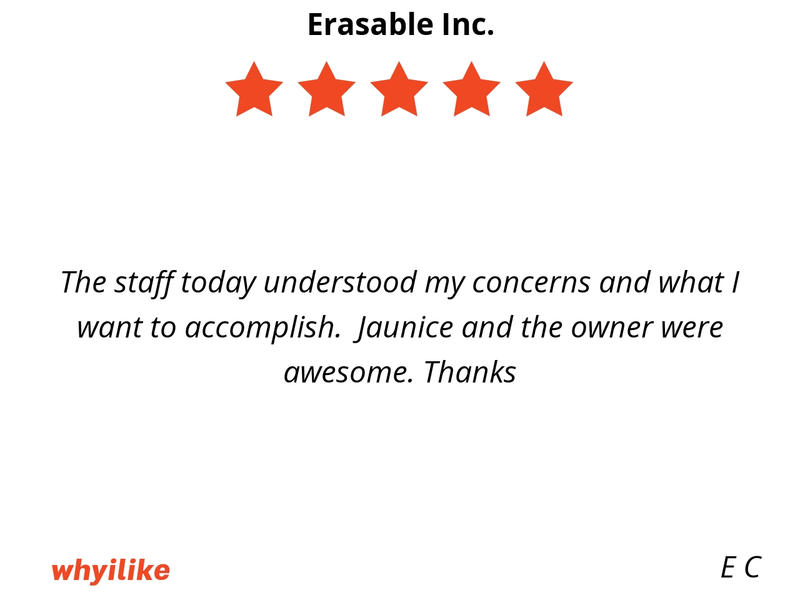 Why I like Erasable Inc. 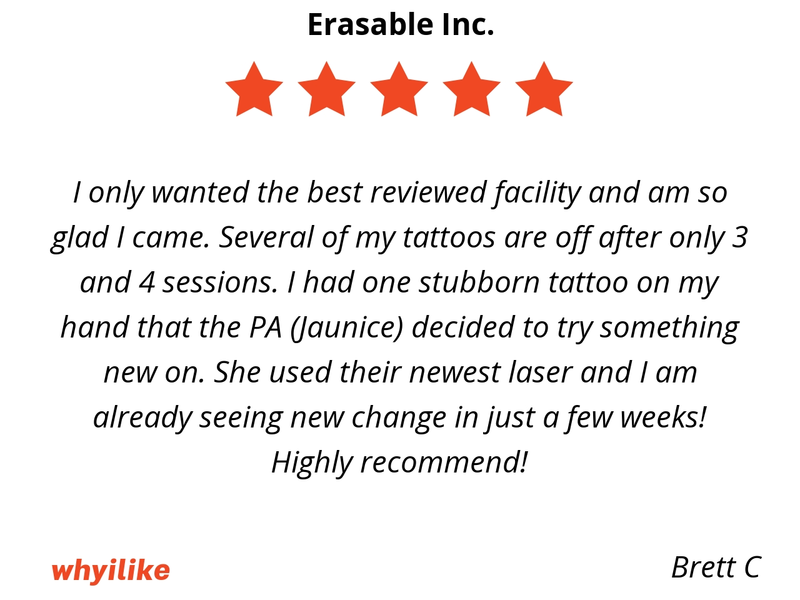 Erasable Inc. is the premier choice for medical spa, tattoo removal, Coolsculpting, microblading, hair removal, Botox and Juvéderm in Tampa FL. Military veteran practitioners and the latest technology deliver exceptional results. Great customer service! 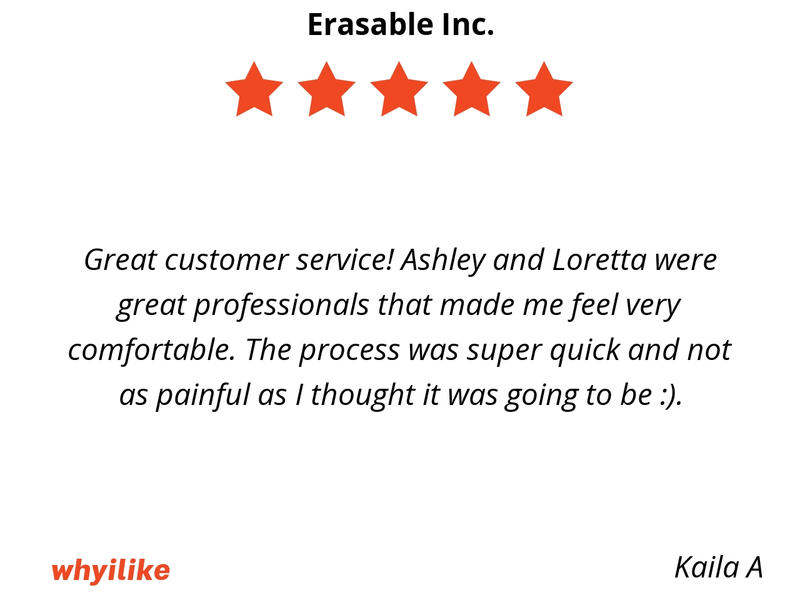 Ashley and Loretta were great professionals that made me feel very comfortable. The process was super quick and not as painful as I thought it was going to be :). 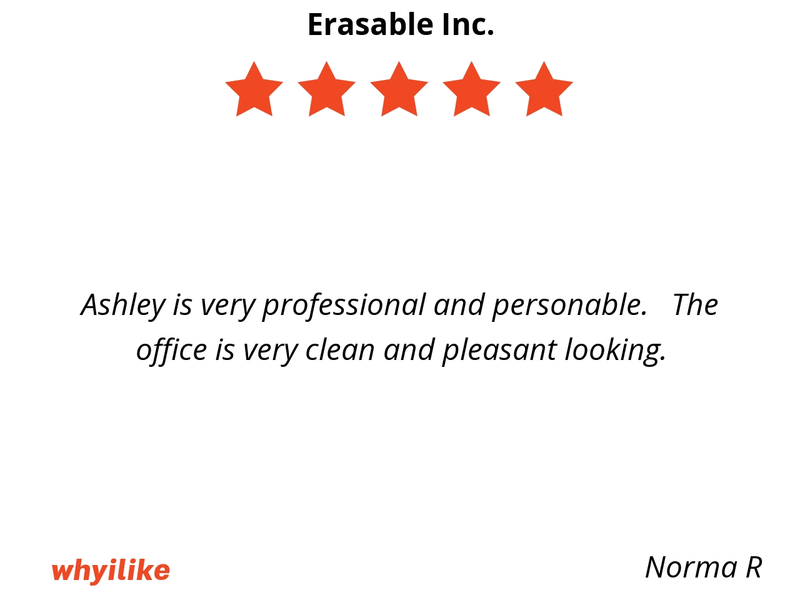 Ashley is very professional and personable. The office is very clean and pleasant looking. Great experience overall! 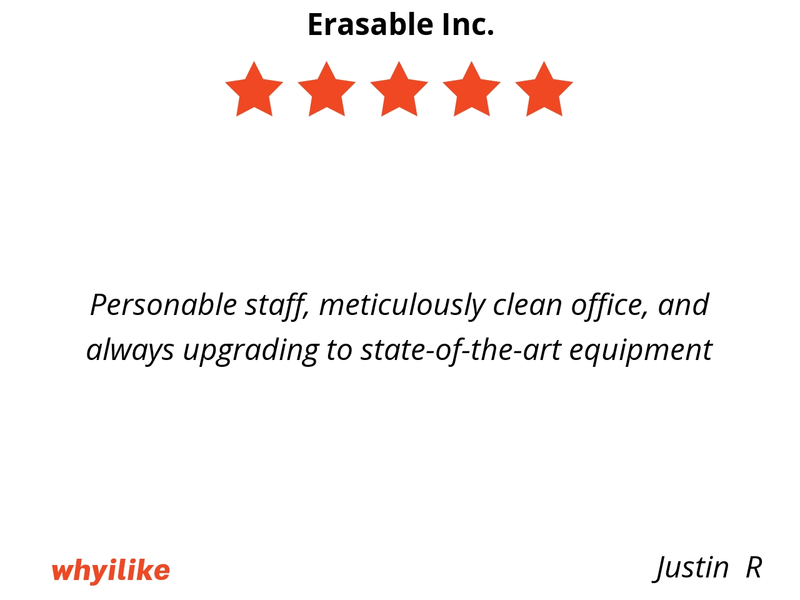 Professional, thorough staff and visit overall! Thank you! The staff are incredible and always make me feel at ease. It is truly a relaxing experience. I have been taken care of by Ashley Ann during most of my treatments and she makes the experience pleasant and my anxiety is always lessened. 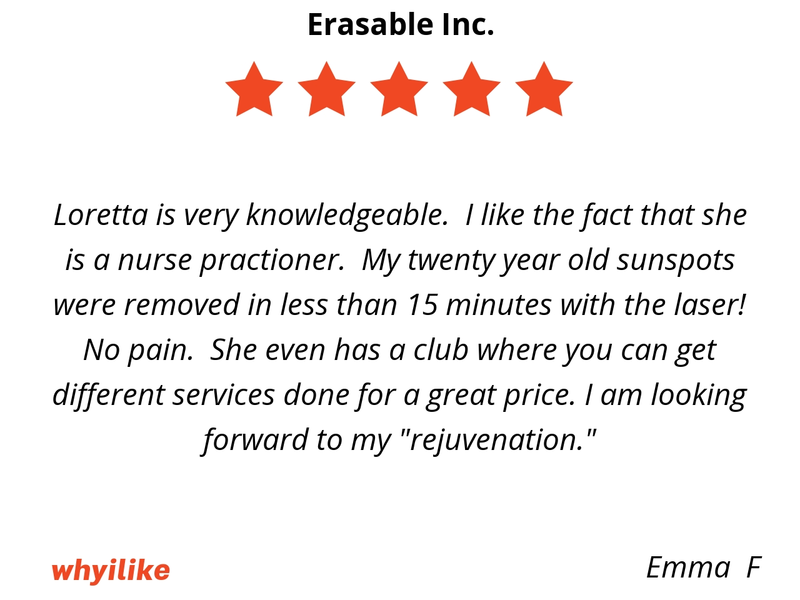 I trust her and all of the staff due to the exceptional care that they have consistently provided me. Thank you all so much! 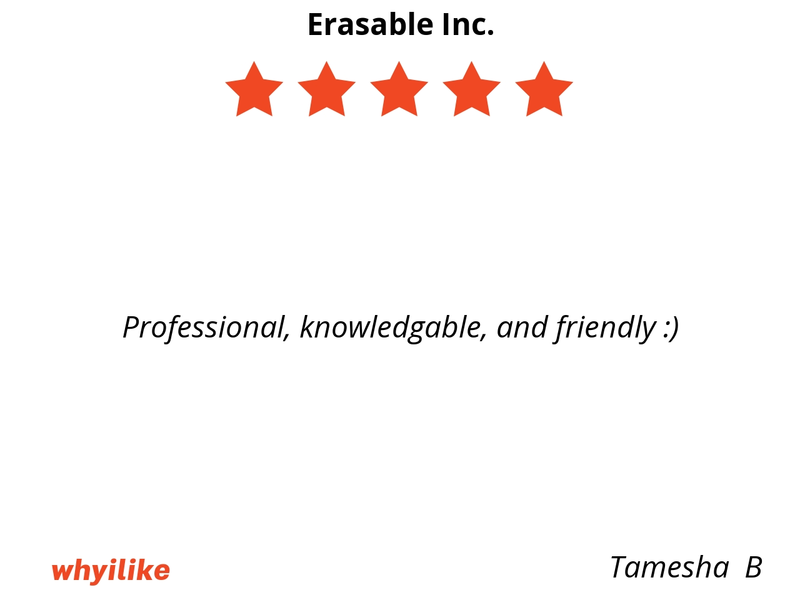 The Erasables team members are all very knowledgeable and very professional and provide a very comforting experience. The staff are all very nice too so overall a very nice experience. I was nervous at first but they make their customers feel very at ease. As soon as you enter the front lobby , there is the lovely Ann there to greet you and make you feel comfortable. 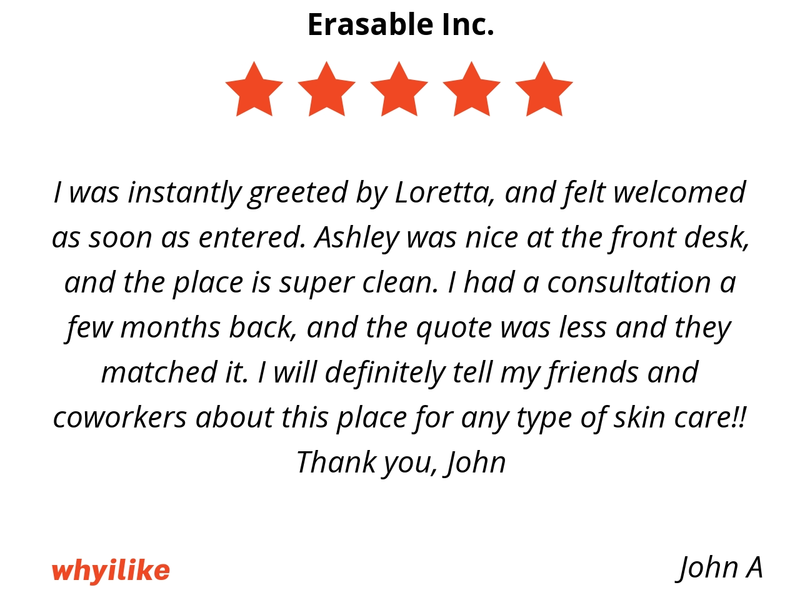 Most offices don't have that special receptionist to make your experience at ease. 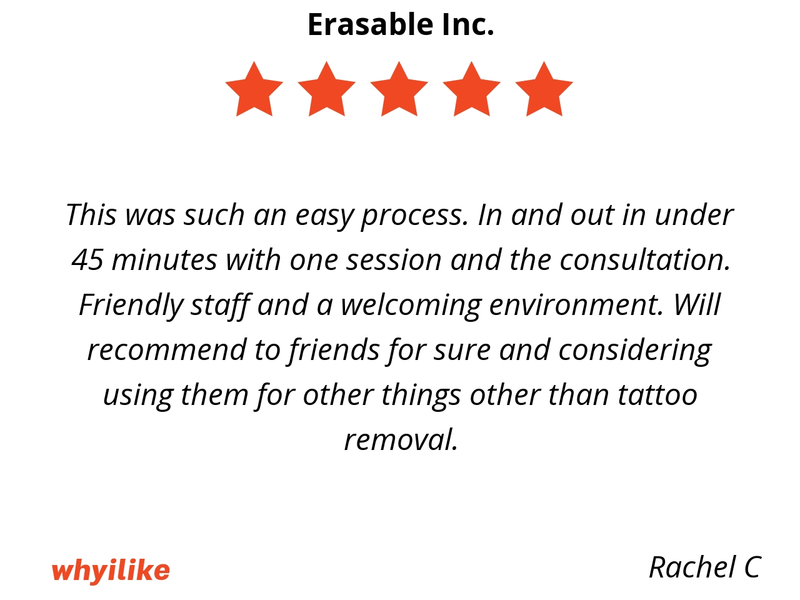 I recommend if your thinking about tattoo removal , come check out this office . The staff is amazing. I only wanted the best reviewed facility and am so glad I came. Several of my tattoos are off after only 3 and 4 sessions. I had one stubborn tattoo on my hand that the PA (Jaunice) decided to try something new on. She used their newest laser and I am already seeing new change in just a few weeks! Highly recommend! They are SO professional and SO good at what they do. 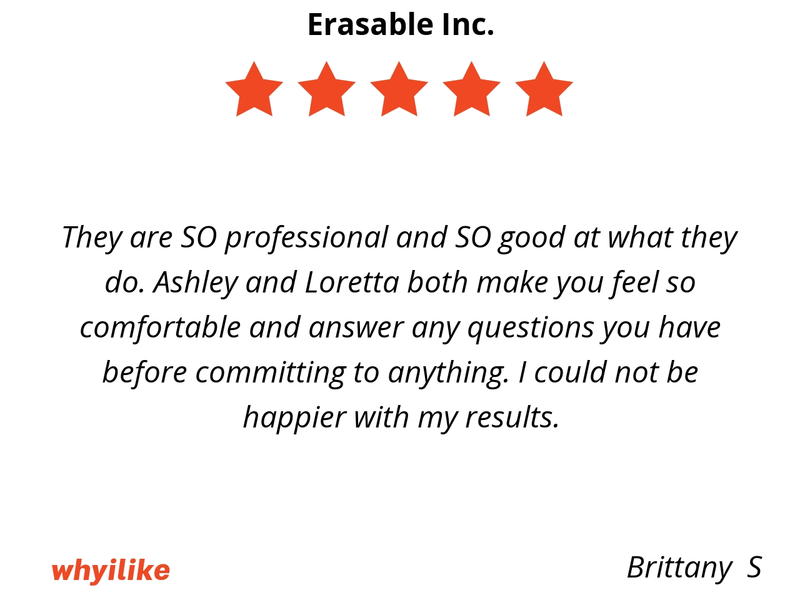 Ashley and Loretta both make you feel so comfortable and answer any questions you have before committing to anything. I could not be happier with my results. Very nice and comforting. Staff madness me feel very comfortable and at ease with my decision to get my tattoo removed. It was a nice experience. 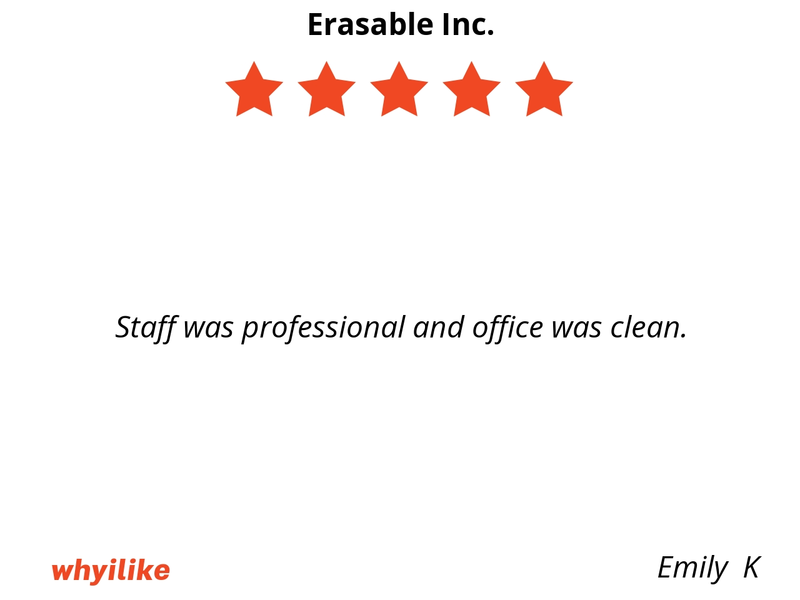 Staff was professional and office was clean. 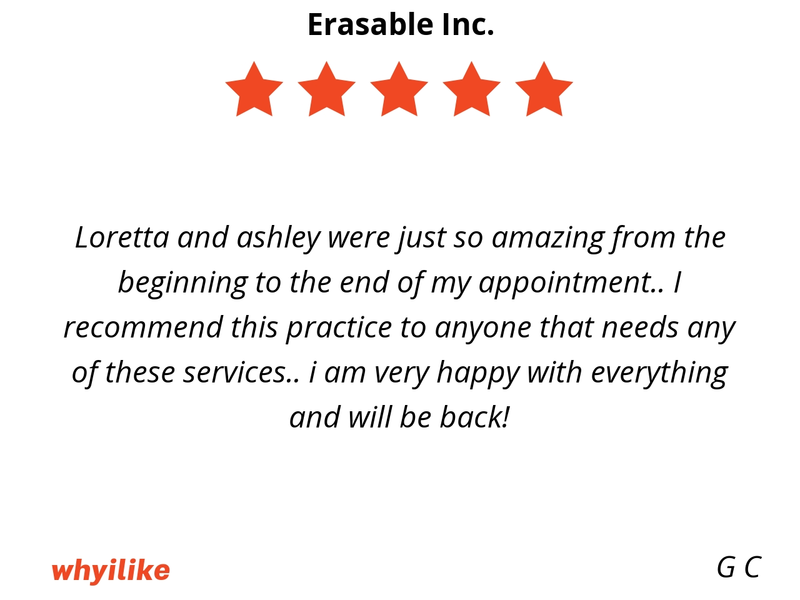 Loretta and ashley were just so amazing from the beginning to the end of my appointment.. I recommend this practice to anyone that needs any of these services.. i am very happy with everything and will be back! This was such an easy process. In and out in under 45 minutes with one session and the consultation. Friendly staff and a welcoming environment. Will recommend to friends for sure and considering using them for other things other than tattoo removal. Ashley is great. Everyone is great. Thank you. 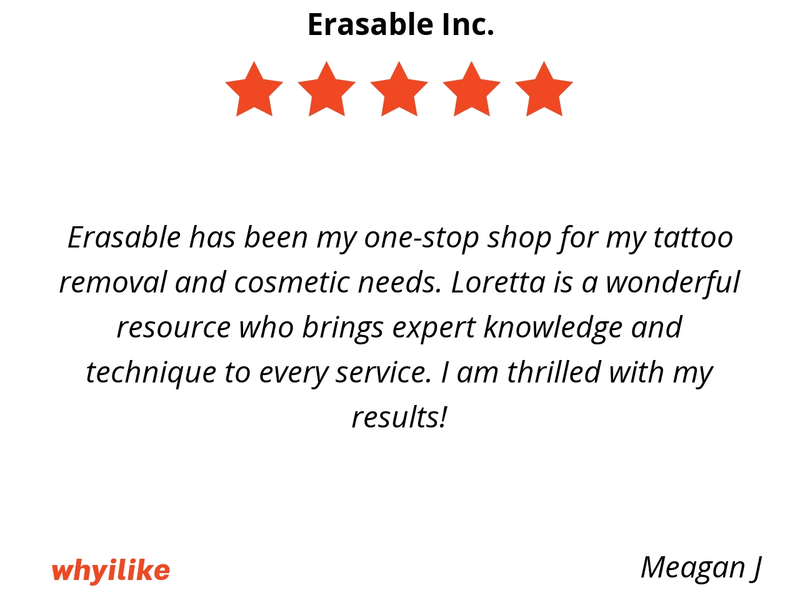 Erasable has been my one-stop shop for my tattoo removal and cosmetic needs. 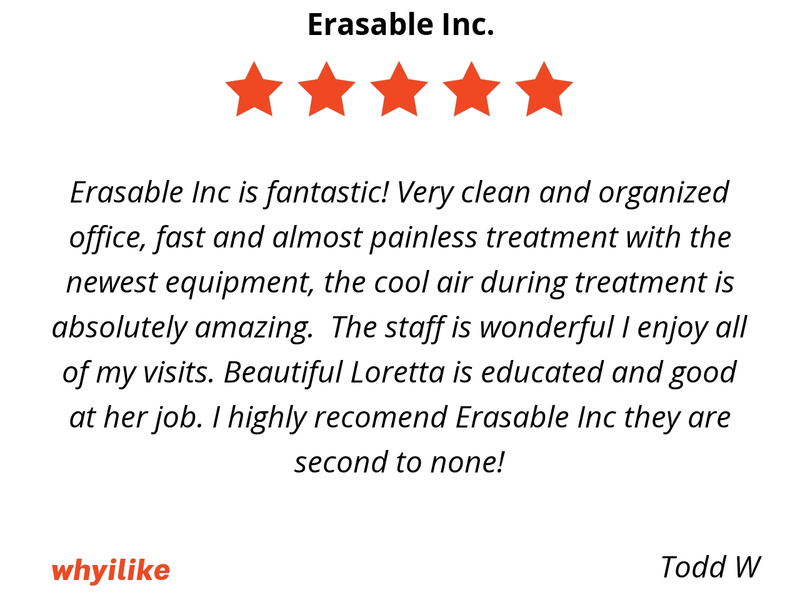 Loretta is a wonderful resource who brings expert knowledge and technique to every service. I am thrilled with my results! Loretta is very knowledgeable. I like the fact that she is a nurse practioner. My twenty year old sunspots were removed in less than 15 minutes with the laser! No pain. She even has a club where you can get different services done for a great price. I am looking forward to my "rejuvenation." 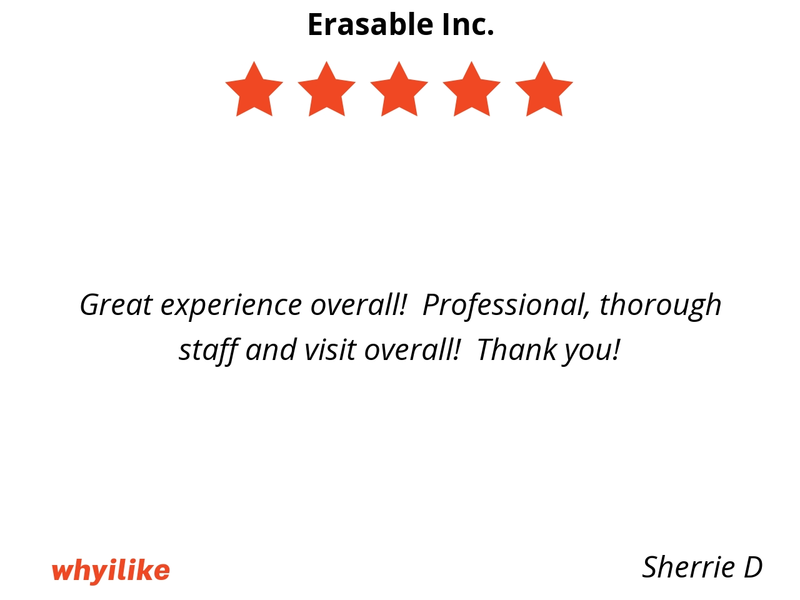 Erasable Inc is fantastic! Very clean and organized office, fast and almost painless treatment with the newest equipment, the cool air during treatment is absolutely amazing. The staff is wonderful I enjoy all of my visits. Beautiful Loretta is educated and good at her job. 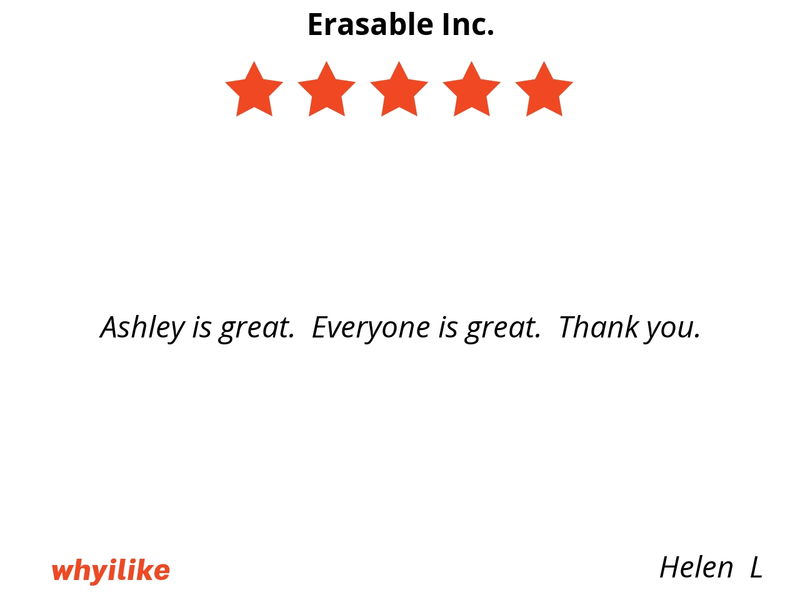 I highly recomend Erasable Inc they are second to none!